#111: A Loud Tortoise Meets A Silent…Mouse?! This update from out of the blue is a bit special, in that it’s a pseudo-crossover. Introducing my new webcomic: Silent Pirate! Updates Going Irregular…More So Than Before. I’m going to stop updating Antisoshell regularly starting with #110. This is usually a death sentence for a webcomic, so I’m not sure what’s going to happen. I still have stuff I want to do with Antisoshell (Animations! Games! Some comics!). However, the comics well is starting to getting stale, and there’s other stuff I want to do, so I can’t continue going the way I’m going now, and I don’t want to end the comic entirely. So, we’ll be entering VG Cats-level update territory in a few weeks. Thank goodness for RSS, I guess? Have a Very Lapine New Year! It’s the Chinese year of the Rabbit starting today (it also happens to be my Eastern Zodiac sign), so I figured I’d ring it in, Antisoshell-style. Hmmm. 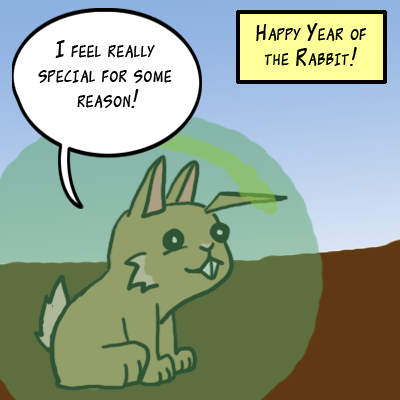 Theoretically, this year would also be a good year to launch any bunny-themed webcomics? Maybe. However, despite wanting to get back to cartooning, I’m still not quite up for woking on Antisoshell again yet; I want to clean up my room a bit and get a few other projects out of the way. In other words, the hiatus’ll continue for a bit: Antisoshell returns on January 24th!